Another Fish Story? Or was it Sam Carman's Trout? One of the many stories or legends still told of early Brookhaven/South Haven is that of the famous Senator Daniel Webster, and of the monstrous trout caught in the pond below the Samuel Carman's mills on the Connecticut or Carmen's river. The above accounts likely report the origin event that led to the “Webster” trout legend which became much embellished with time. It is interesting to note that Daniel Webster was not mentioned in these origin accounts. Others, however, date the Webster trout event variously dates in the 1820s. Sources for these dates have not yet been found. There are several artifacts still extant almost two centuries after the event which assist in telling the story. One is a wooden carved weathervane said to have been based on an original drawing made at the time of the catch, and which, for a time, rested atop the South Haven Presbyterian Church steeple; another is a Currier and Ives lithograph thought by some (generally in fishing circles) to depict Daniel Webster catching the trout in the river; and the third is a plaque on a pew in the nearby old South Haven Presbyterian Church identifying the Suffolk Club, a well know hunting and fishing club which occupied the banks of the river and to which Daniel Webster is said to have been associated, at least in its early 19th century iteration. There is little question that Daniel Webster and Samuel Carman were friends, and that Webster, along with other wealthy and influential New Yorkers, regularly visited the Carman tavern and inn to fish in the adjacent river. However, there is little contemporaneous evidence that Webster himself caught the record-sized trout, or that the event took place in the context of a Sunday morning church service, as some recount below. “Fish stories” are not always told by fishermen. It, or another facsimile, early on became the weathervane atop the steeple of the South Haven Presbyterian Church across the road from the Carman homestead/inn. It was said to have been struck by lightning and fell to the ground. The original of this fish weathervane is now on loan by the church to the Bellport-Brookhaven Historical Society museum. In 1976, two replicas of this fish were made, one of which was placed atop the Presbyterian church steeple, the other atop a flag-pole at the historical society. The fish was reluctant to maintain its perch, however, and was twice dislodged after 1976—the most recent in a violent nor'easter on March 13, 2010, with recorded winds of 60-75+ mph, which caused considerable damage across Long Island. Some have suggested that the so-called “Daniel Webster” trout caught in the Carman's River was probably what is known as a "salmon-trout" which, it is said, can grow to enormous size, and spends part of its life cycle in salt water. See Richard A. Thomas references, this page. In addition to the above mention in the New York Gazette and New York York Evening Post, the giant fish is mentioned in the Niles Weekly Register of the same period—specifically attributing its capture to Samuel Carmen, Jr.
Click here or on article title for text in a new window view. 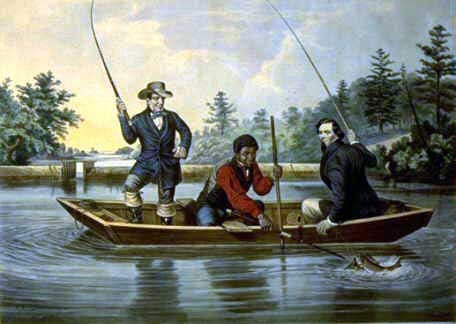 The following article from the Brooklyn Eagle is the first account of the trout legend so far found that connects Daniel Webster with a huge trout caught in the Carman's River. While modern telling of the story has Daniel Webster catching the fish, we have not found any 19th century accounts where Webster is the actual fisherman. In this account he just purchases the trout at extraordinary cost after it has been captured by others. If one were to read just the headlines, one can see how the legend was beginning to develop. It is also interesting to note that in this account no mention is made of the South Haven Presbyterian Church, or that the drama of the fish's capture has anything to do with the church. Many local skeptics believe that the fish was caught by some anonymous local, or perhaps Samuel Carman himself, and embellished, as fishermen are wont to do, over the decades. The major focus of this this article is the dispute between landowners—in this case the famous Suffolk Club and the Tangier Smith family—over who actually owned the Carman's River. This was a dispute that continued into the 20th century. By the 1930s, this Webster legend had grown such that, as the story now goes, Daniel Webster was attending the church service at the Presbyterian church nearby when a slave/servant came in and loudly whispered to Webster that the giant fish was seen in the pond. Webster quickly got up and left. The remaining congregation also soon went outside and lined the pond's bank, causing the minister to terminate his sermon and join them. Webster then makes a dramatic catch, has the wood carving made, and takes the fish to New York where a feast is prepared hosted by Webster at Delmonico's. This version, as detailed by the Rev. George Borthwick (known for his story telling) in his book The Church at the South, A History of the South Haven Church, now takes three pages to tell . Click here or on article title for text in a new window. An expanded bibliography of trout references, especially as they relate to Long Island, New York. By Dr. Richard A. Thomas. 6 July 2011. In addition to the references displayed on this page, Dr. Thomas, in this bibliography, lists other references to trout (including their textual content), especially "big" trout, as they may relate to Webster's "trout." Catching a Trout, We Hab You Now, Sar!—While the subject of this N. Currier lithograph is widely reported, both locally and elsewhere, as being of Daniel Webster and his slave (or servant) at the Carman's River in South Haven, L.I., NY, the preponderance of evidence is that it has nothing to do with either Daniel Webster nor the catching of a giant trout in the Carman's River.. It was done by Otto Knirsch ca. 1854-7 after a painting by Arthur Fitzwilliam Tait some 35 years after the reputed Daniel Webster incident. When the association between the print and Daniel Webster came about hasn't been established; except it was well known that Daniel Webster was a trout fisherman and a friend of Samuel Carman, proprietor of the mill and pond, and the inn on its shore. Perhaps some thought the person in the print bore a resemblance to Daniel Webster. 1854 is long after the event—Daniel Webster and the Big Trout—supposedly occurred, and the association of that event with this N. Currier print seems to be of fairly recent origin. Rev. George Borthwick, in his telling of the story (pp. 186-189 in The Church at the South, A History of the South Haven Church, completed in 1939 but not published until 1982) makes no mention of the lithograph. Other evidence appears to demolish the claim that the print shows Daniel Webster catching a fish in the pool below Samuel Carman’s mills at Fire Place (or anywhere else, for that matter). An original of this lithograph is on loan to the Bellport-Brookhaven Historical Society museum by the Old South Haven Presbyterian church. The following article, from a 1906 issue of Forest and Stream (predecessor to Field and Stream) provides a somewhat more fanciful account of the great trout. In this account, Daniel Webster is not present at its capture. However the drama of the event now involves a Sunday service at the Presbyterian church. In the account, the fish is caged in, but allowed to live for a time. Daniel Webster is notified of the trout's capture, orders that it be kept alive until he can travel out to the Island. He purchases it for a reasonable amount, and returns with it to New York City where it is served at a private dinner party. This article from Early American Life provides a modern, even more fanciful telling of the events. And this version adds even more details to the "fish tale." The first chapter of Nick Kara's 1997 book, Brook Trout, brings the telling of the Webster "trout" story to modern times. In the annotated version below, Dr. Richard A. Thomas extensively footnotes Kara's work, providing insights into some of the characters and places of the story, and highlights conflicts with historical facts which tend to question the authenticity of some of the details which have crept into the tale since the 1800s. Click for text in a new window view.